Some of the school supplies donated by HHSA employees at the North Central Family Resource Center/Public Health Center. The numbers add up in a big way. And just in time for the start of school. HHSA employees at the Family Resource Center and Public Health Center on Ruffin Road, along with the East and North Central Regions’ Community Health Engagement Team, had a very successful school supply drive for students at Walker Elementary School in Mira Mesa. 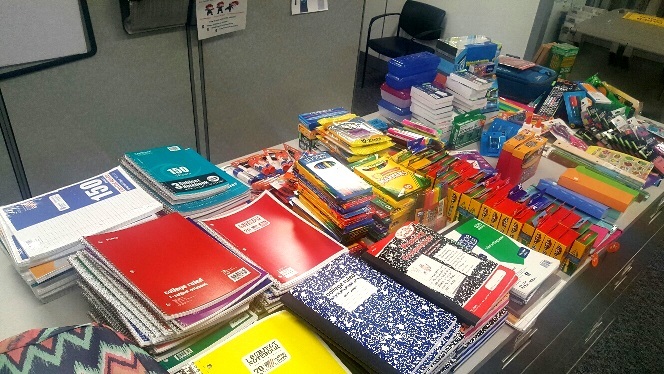 The employees collected 43 backpacks, 62 notebooks, 39 boxes of crayons, 24 boxes of pencils, 77 glue sticks and 15 boxes of pens, among many more items. Gubany and Gillespie are the HEART Jr. ambassadors for the Family Resource Center/Public Health Center. Jr. ambassadors promote positivity in the workplace, encourage coworkers to take customer service trainings and acknowledge staff that provide exceptional customer service. Walker Elementary serves approximately 500 transitional kindergarten through fifth grade students. Nancy Gubany, left, and Monica Gillespie are Jr. HEART ambassadors and organized the school supply drive.